A chilling nightmare plays out at a Titan II missile complex in Arkansas in September, 1980. A worker accidentally drops a socket, puncturing the fuel tank of an intercontinental ballistic missile carrying the most powerful nuclear warhead in our arsenal, an incident which ignites a series of feverish efforts to avoid a deadly disaster. 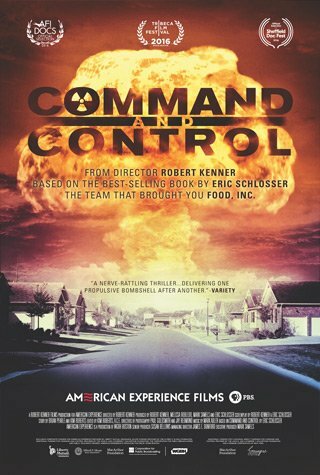 Directed by Robert Kenner (FOOD, INC.) and based on the critically acclaimed book by Eric Schlosser (FAST FOOD NATION), COMMAND AND CONTROL is a minute-by-minute account of this long-hidden story. Putting a camera where there was no camera that night, Kenner brings this nonfiction thriller to life with stunning original footage shot in a decommissioned Titan II missile silo. Eyewitness accounts — from the man who dropped the socket, to the man who designed the warhead, to the Secretary of Defense— chronicle nine hours of terror that prevented an explosion 600 times more powerful than Hiroshima.